Thank you for your interest in supporting Rutherford County Area Habitat for Humanity! We have several ways to partner with us and sponsor a safe, affordable and quality house for low income families in need! Our Habitat for Humanity houses are well built and energy efficient. Each house costs between $80,000 and $100,000 to build, including construction fees, materials, labor and services. Each house requires over 200 volunteers to help with the construction! RCHFH cannot build simple, decent, affordable homes without the financial support of individuals, businesses, churches, organizations and foundations in Rutherford County. Sponsors are key to our success and we can work with you to develop the best sponsorship plan for your company, budget and needs. Some companies want many Volunteer Days to offer to their employees, while some do not have the volunteers to offer for. Some companies want a lot of community and media exposure, while some do not. Some companies want to allocate their funds to one specific Habitat Build, while others would rather spread them out across several builds. We will build 8 Habitat houses in 2016 and hope to increase that to 10 houses in 2017. We’re scheduling for both 2016 and 2017 now – so we can discuss your commitment over the two years, if you’d like. Habitat Volunteers: Our builds are 8-10 weeks and we have volunteer days on Wednesdays, Fridays and Saturdays. If for some reason you would like a different day for your volunteers, let us know and we may be able to accommodate that. Typical volunteer days are 8:30 – 3:30. On occassions we can have “split days” (before and after lunch). We’ll work with you on whatever Volunteer schedule you would like! By the way, volunteers do NOT need to have construction skills and experience. We have staff that will work with volunteers – and many love that they can learn construction, home maintenance and tool skils, all while giving back to the community! ⇒ Please do let us know if YOUR company has a Employee Volunteer Grant Program and how we should submit those hours. It takes a village: It takes over 200 volunteers to build each Habitat house and in 2015 we had 3089 volunteers – for a total of 16,137 hours! Our House Build Sponsorships are a great opportunity for corporations and local businesses to engage their employees, offer a unique team building experience and present a meaningful community service event, as well as excellent marketing opportunities, social media traffic, public and community relations, and media exposure. Sponsorship Levels: We have many sponsorship levels and can also design one specifically for your needs. Our houses typically cost $80,000 – $100,000 to build, depending on the size, style, features, varying material costs and land costs. Sponsorships are donations and are tax deductible (consult your tax advisor). We are a 501 (c) 3 nonprofit. Full House Sponsor: $60,000 for first choice on all Build Days, up to 20 employee volunteers per day on the job site. Additional sponsors or grants may be applied to this to cover construction costs. Benefits including signage, website & social media, press releases, marketing materials, photos and video, company presentations, t-shirts & lunch, dedication program, ribbon cutting keys presentation, etc. Building Hope Sponsor: $30,000 for 15 Build Days, up to 20 employee volunteers per day on the job site. Additional benefits including signage, website & social media, press releases, marketing materials, photos and video, company presentations, t-shirts & lunch, dedication program, ribbon cutting keys presentation, etc. Rooftop Sponsor: $15,000 for 7 Build Days, up to 20 employee volunteers per day on the job site. Additional benefits including signage, website & social media, press releases, marketing materials, photos and video, company presentations, t-shirts & lunch, dedication program, etc. Foundation Sponsor: $7,000 for 5 Build Days, up to 20 employee volunteers per day on the job site. Additional benefits including signage, website & social media, press releases, marketing materials, photos and video, company presentations, t-shirts & lunch, dedication program, etc. Blueprint Sponsor: $5,000 for 3 Build Days, up to 20 employee volunteers per day on the job site. Additional benefits including signage, website & social media, press releases, marketing materials, photos and video, t-shirts & lunch, dedication program, etc. Day Sponsor: $2,000 for 1 Build Day, up to 20 employee volunteers on the job site. Additional benefits including website & social media, photos and video, t-shirts & lunch, dedication program. We have a few unique builds that include sponsorship opportunities – and we can design any type sponsorship that works for you! Panel Build: $8,000 to host a one day wall-building and house framing event at your location that can accommodate 50-150 employee volunteers. During the event volunteers build all the walls for the exterior and interior of a Habitat house, and the walls are used to construct a temporary house right at that location – all in 5 hours. It’s an exciting event that attracts a lot of community and media attention! Employees can work in half to 1-hour shifts so companies can include many teams and divisions. At the end of the day, the walls are deconstructed and moved to the location of the next Habitat Build. Signage, press releases and many benefits are included. It’s possible to split this sponsorship with others or apply a grant or lumber donation to the event. “Opening Doors” Sponsorship: $20,000 buys all the doors and windows for 5 Habitat Houses and credit for the sponsorship will be applied to all five house builds and include signage and marketing opportunities as well as 3 build days per house! This is a great way to increase your impact, exposure and employee volunteer opportunities. “A Roof Over Their Head” Sponsorship: $28,000 buys all the roof materials and labor for 5 houses, including trusses, decking, shingles and professional labor. Like the “Opening Doors” Sponsorship, this includes signage and marketing opportunities as well as 3 build days per house! This is a great way to increase your impact, exposure and employee volunteer opportunities. “Foundations for Affordable Housing” Sponsorship: $37,000 buys the concrete slab foundations for 5 houses, including the concrete, slab prep and professional labor. Like the “Opening Doors” Sponsorship, this includes signage and marketing opportunities as well as 3 build days per house! This is a great way to increase your impact, exposure and employee volunteer opportunities. “Business Build” Sponsorship: we can develop a custom theme build for your industry or business partners, such as a “Healthcare Build”, a “Dental Build”, a “Legal Build” or general “Business Build”. We would develop the sponsorship levels needed to total our building costs of $60,000 which could include a Rooftop Sponsor ($15k) + Foundation Sponsor ($7k) + 19 $2000 Day Sponsors – or any such combination. The advantage of a Business Build is that companies work and network together on the 10 week build and can get community and media exposure for their industry and work. Let us know what kind of business build would work for you! If you’re a contractor, service provider or manufacturer who can provide labor and materials for part of the construction, or a valuable service or product to Habitat, or are able to donate land to RCHFH (we need land!! ), please let us know and we’ll develop a sponsorship to meet your needs. There are many ways that our supporters fund their sponsorships including: HR budget for employee engagement & community responsibility, Marketing budget, Sponsorship applications, Foundation Grants and even Employee Volunteer Grant Programs(corporations often pay a dollar amount for every hour that employees volunteer). We are happy to work with you on finding and securing those funds, appealing to the corporate office, or presentations to your staff (including a meet & greet with Habitat Partner Families and/or a tour of Habitat homes) and we can complete any sponsorship or grant applications necessary. In most cases we can spread those sponsorship payments out into quarterly payments or divide large donations to cover two fiscal years. There are also a few opportunities to match your sponsorship with a large grant (such as Federal Home Loan Bank’s AHP-Affordable Housing Program or HOME grant), doubling your commitment! 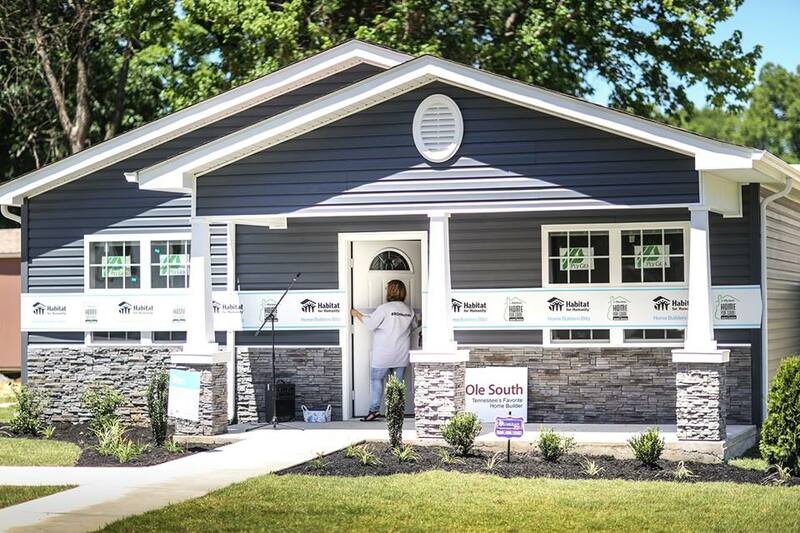 Rutherford County Area Habitat for Humanity (RCHFH) is a 501 (c) 3 nonprofit and is listed in Giving Matters of The Community Foundation of Middle Tennessee. The GyuideStar listing has a detailed profile of RCHFH, including: Mission and History, Financials and Current Budget, Staff and Board of Directors, Programs and Community Impact. We are experienced in writing grants and can work with you to secure funding through your corporate or Foundation grant programs. You may not even know much about them – but we can do the research! Our programs typically fall into the grant category of “Housing” but we also have outcomes and impacts in the areas of Heaalth, Education and Social Services. Many companies also have separate budgets and application processes for “Event Sponsorships” or Marketing Programs. A great way for employees to bond during a community project! 1 Build Day, up to 20 employee volunteers on the job site. Additional benefits including website & social media, photos and video, lunch, dedication program. 3 Build Days, up to 20 employee volunteers on the job site per day (total of 60 employees!). Additional benefits including house signage, press releases, marketing materials, website & social media, photos and video, t-shirts & lunch, in dedication program. 5 Build Days, up to 20 employee volunteers on the job site per day (total of 100 employees!). Additional benefits including house signage, website & social media, press releases, marketing materials, photos and video, company presentations, t-shirts & lunch, and in dedication program. 7 Build Days, up to 20 employee volunteers per day on the job site (up to 140 employees!) Additional benefits including signage, website & social media, press releases, marketing materials, photos and video, company presentations, t-shirts & lunch, may speak at dedication and will be in the dedication program, etc. 15 Build Days, up to 20 employee volunteers per day on the job site (up to 300 employees!) Additional benefits including signage, website & social media, press releases, marketing materials, photos and video, company presentations, t-shirts & lunch, may speak at dedication, share in ribbon cutting and keys presentation and will be in the dedication program, etc. We may be able to MATCH this donation with a large grant – and name the build after your company! All Build Days, up to 20 employee volunteers per day on the job site (300-400 employees!) and the “build” will be named after your company (ie: Saint Thomas Health Build). Additional benefits including signage, website & social media, press releases, marketing materials, photos and video, company presentations, t-shirts & lunch, speak at dedication, ribbon cutting and keys presentation and will be in the dedication program, etc. This donation pays for the entire construction of a Habitat house! It includes all Build Days, up to 20 employee volunteers per day on the job site (300-400 employees!) and the “build” will be named after your company (ie: Nissan Build). There will not be any other companies/sponsors on this build. Builds days can be given to schools, churches, groups and even your clients, as you wish. You may also choose different volunteer days (except Sunday). We can custom this build to meet your needs! All benefits including signage, website & social media, press releases, marketing materials, photos and video, company presentations, t-shirts & lunch, speak at dedication, ribbon cutting and keys presentation and will be in the dedication program, etc. Thailand Funds assisted in ongoing tsunami recovery. Madagascar Over 90% of urban residents in this country live in slum communities. Prone to flooding and cyclones, slums often become cesspools of stagnant water, sewage & malaria-carrying mosquitoes. HFH Madagascar enlarges pathways and installs drainage systems, constructs public toilets, laundry and water points as well as building homes. Cameroon This country is experiencing rapid population growth and urbanization. People migrate here in hope of finding employment, but find very high property prices and overcrowded rental units (2-6 people per room). In desperation, many resort to using recycled waste materials to build makeshift shelters. Nearly 4 out of every 10 live on less than $1 per day. Through community based partnerships, HFH Cameroon secures land and provides affordable housing options. Uganda In 2012, we will be sending a portion of our tithe to this country. Conflict in this region has resulted in instability and displaced people, alongside the effects of HIV/AIDS, malaria and poor health care. This has resulted in the orphaning of around 45% of Ugandan children. Extreme poverty is another problem. 38% of the population lives in grass thatched huts. HFH Uganda helps secure land and build homes. They also include training in health and other relevant life skills for the families. Habitat’s Tithe Program: WE GIVE BACK! The word “tithe” comes from the tradition in which people of certain faiths would donate ten percent of their income to their religious institution. Through Habitat’s tithe program, Habitat partners are encouraged to donate a tenth of what they raise in support of house building in another country, encouraging all programs to participate in the international effort to eliminate global poverty by sending a portion of what is raised in their home country elsewhere.